We carry another piece of news about the east coast today. Two major express bus operators in Kota Bharu, Kelantan i.e. Konsortium E-Mutiara Berhad & Tiara Pesona Sdn Bhd, have signed purchase agreements with Scania Malaysia to expand their respective fleets with Scania coaches. Both express bus operators have chosen the Scania K410EB6x2 coach. Konsortium E-Mutiara will be acquiring 20 units while Tiara Pesona will be acquiring 28 units. This Scania coach features a powerful engine with higher torque at lower revs and is equipped with the Scania Opticruise gear-change technology that provides better comfort while reducing clutch and synchromesh wear. Pesona’s Chief Executive Officer Wan Mohd Nur Faiz Hilmi B. Wan Hamat and Scania Southeast Asia Services Director, Thor Brenden. importantly, passenger comfort (it is also popular among drivers for its driving comfort), which are crucial factors for tour operations. Other important considerations are the high uptime and efficient after-sales services from Scania. The coaches come with two years of free Scania Maintenance and free 24/7 Scania Assistance as well as a ten-year free Fleet Management System (FMS) basic package. 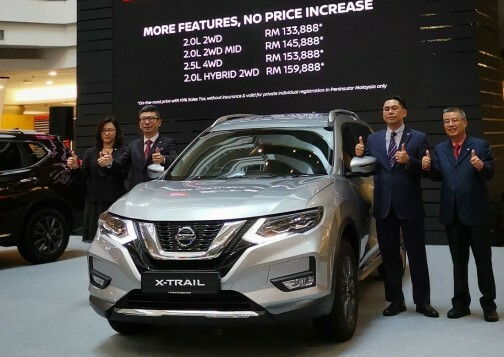 The acquisitions will be made with a combination of cash and financing by Scania Credit Malaysia, which is offering attractive and comprehensive financial-solution packages for customers. 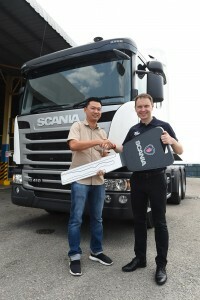 Konsortium E-Mutiara is also subscribing to the Scania FMS total solutions package which includes Scania Repair and Maintenance for service matters as well as Scania Driver Training and Coaching services that will help increase the productivity by achieving better fuel economy and reduced cost of operations. 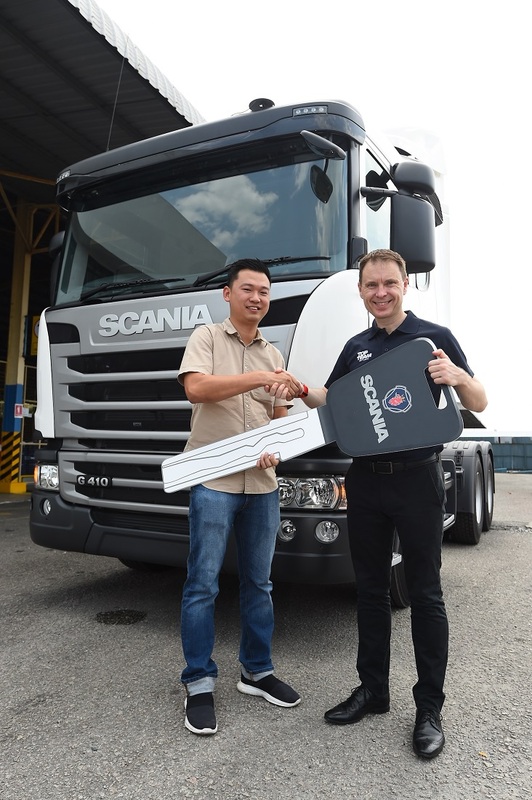 L-R: Strong Horse Transport Managing Director, Oh Han Khim receiving the mock key from Scania Southeast Asia Services Director Thor Brenden. As an aside, the Scania Open Day event also saw the handover of two units of Scania G410LA6x2HSZ trucks to Strong Horse Transport Sdn Bhd, represented by its company director, Mr. Oh Han Khim. With the purchase facilitated by Scania Credit Malaysia, the acquired G-series trucks offer powerful performance and increased fuel savings. 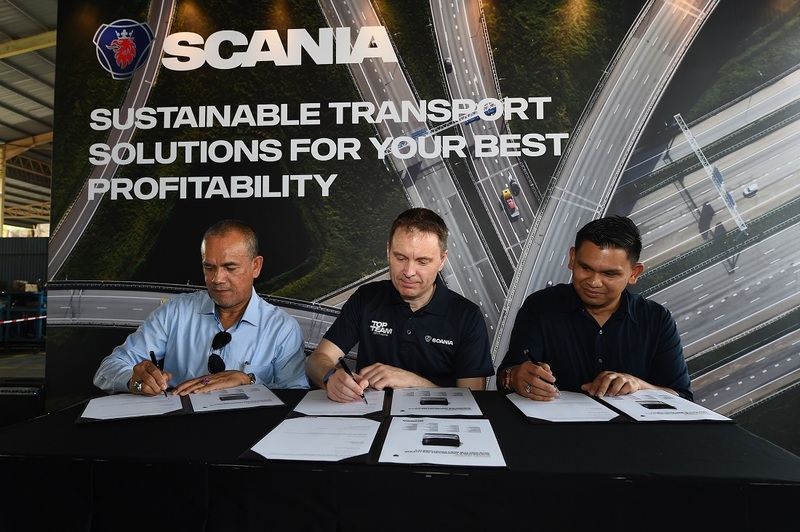 “We are proud to be partners with Konsortium E-Mutiara, Tiara Pesona and Strong Horse Transport for its long-haul operations and are indeed very happy that they have once again placed their trust in Scania for the best profitability and sustainability of their business,” said Brenden.